Among the many unique challenges of preparing for an expedition on unfamiliar terrain, route selection poses a complex dilemma. Though we have maps that indicate roads or trails through the desert, we cannot tell what their condition may be, whether or not they will be passable, or even if they still exist. For the trans-Sahara project we are going to have to know how to drive and assess trails en route, without prior scouting and with little or no reliable information. To get a sense of the kind of difficulties we might encounter, I spent some time exploring the Ocala National Forest in northern Florida — though not desert terrain, it was still terra incognita for me. Encompassing approximately 383,000 acres, the Ocala National Forest is the southernmost forest in the continental United States. Centered on high, dry, central ridges of sand pine scrub, it contains more than 600 lakes, rivers, and springs surrounded by subtropical growth. 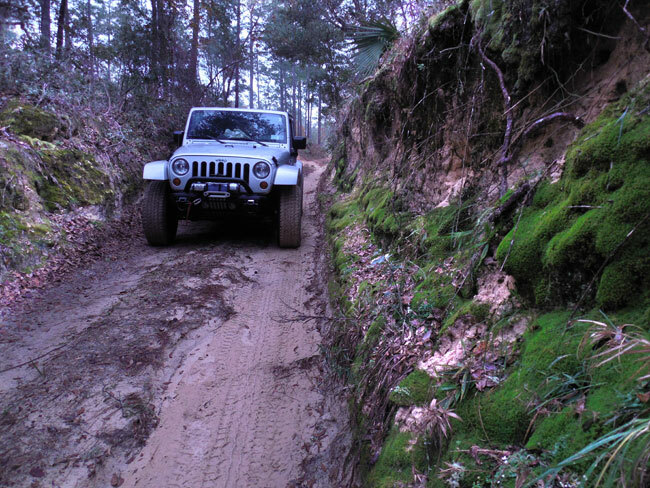 It also has hundreds of miles of Forest Roads and Jeep/OHV trails. I set out for a five-day outing alone in the backcountry equipped with a Delorme atlas, the up-to-date Motor Vehicle Usage Map for the forest, a Garmin GPS, an assortment of compasses and several sectional topo maps of areas of interest. 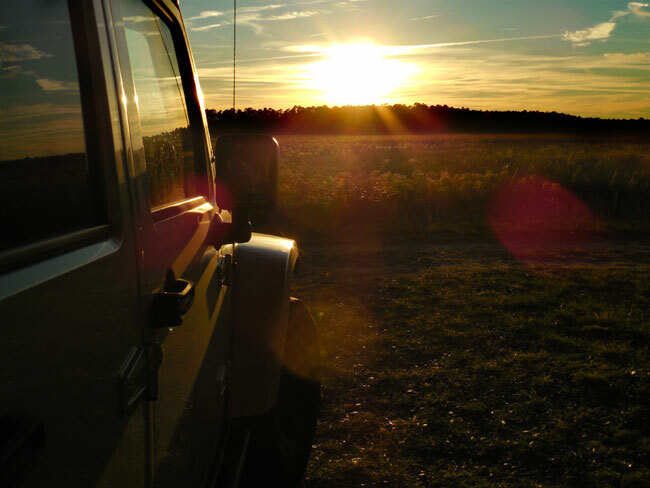 I would be camping along the way, so I also had all the necessary camp gear, as well as emergency supplies and recovery equipment for the Jeep. Turning off pavement, I entered the forest via FR33, a wide dirt road that runs north-south alongside the Juniper Prairie Wilderness area. The landscape was interesting in a desolate kind of way. It was more “open” than what I usually associate with the word “forest.” The terrain was very sandy and very flat, with lots of scruffy palmettos. 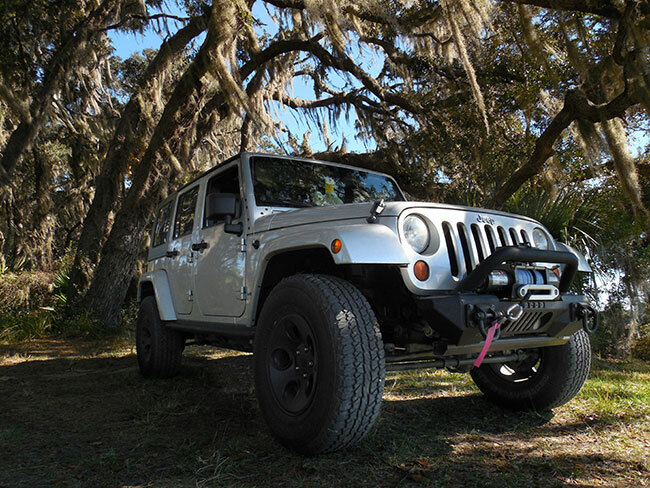 I set up a base camp not far from a marsh, tucking the Jeep into a cove of trees draped in “spanish moss” — natures own camouflage netting. I had pre-selected a series of trails on the map to “explore” in an area to the north of my campsite. 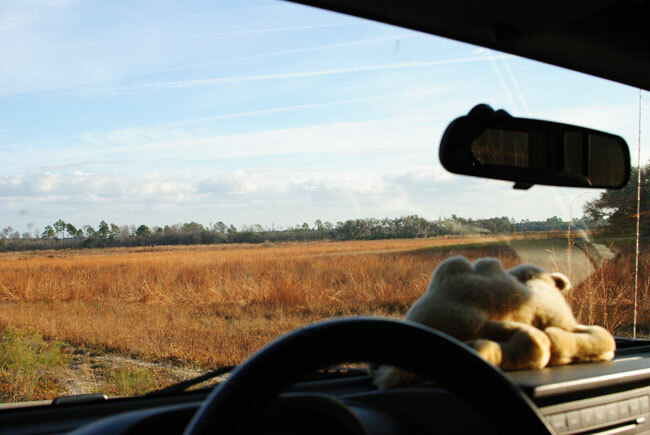 The driving should be easy along flat and sandy dirt roads. None of the dangers of the desert environment. And no complicated technical driving or rough rugged terrain like what we have seen out west. The Forest Road trails are almost all “straight” and run in a familiar grid pattern, so navigation shouldn’t be too complicated either. I was feeling relaxed as I took off along the edge of the marsh. It was quiet, and the sun tinted the marsh grass with a golden glow. The trail weaved in and out of the woods, with sections that were wide open alternating with areas of thicker tangled jungle-like vegetation. 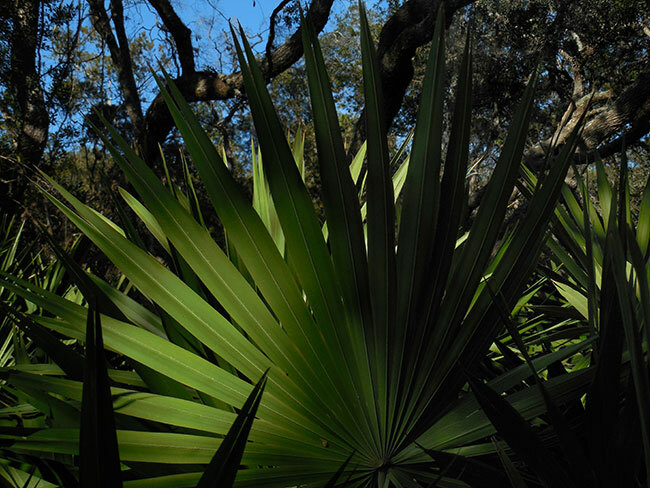 The light hit the translucent fronds of the palmettos in a way that made them seem “neon.” Spanish moss and the twisted forms of gnarled tree trunks fascinated me. 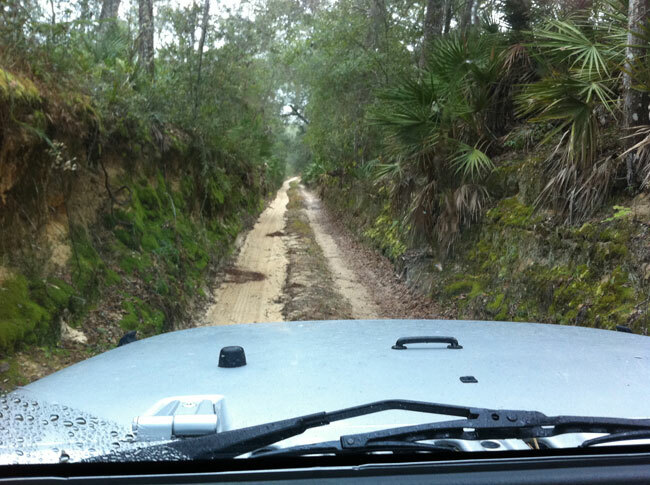 As I continued north on a smaller Jeep trail instead of the “main” forest road, the passage became more overgrown. I wanted to stay on the legal trails clearly indicated on the official Motor Vehicle Usage Map, but it began to become difficult to tell where the legal “trail” was. Hunters and others had made their own trails. And these “off-shoot” trails were unmapped, but forked off the mapped trail, then seemed to run parallel for a while before branching off in some other direction. Looking at the map, I would follow what appeared to be the most used path that matched up with the correct heading, only to end up in an overgrown spot leading to a hunting blind or a tree stand — or the trail would just disappear into the bush without a trace. What had seemed so clear and straightforward on paper was in reality turning out to be a messy maze of trails and tracks. The GPS was no help, as I didn’t have precise coordinates for the “trail” I was on, and besides, with the “off-shoot” trails running parallel, they were within the margin of error of the GPS anyway. I took to scouting on foot at each unexpected fork in the trail to see where each path led, and to confirm that I would be able to turn the Jeep around at some point if it proved to be the wrong path. I was using the map and compass together to try to determine if a turn in direction matched up with the line I thought I was following on the map. 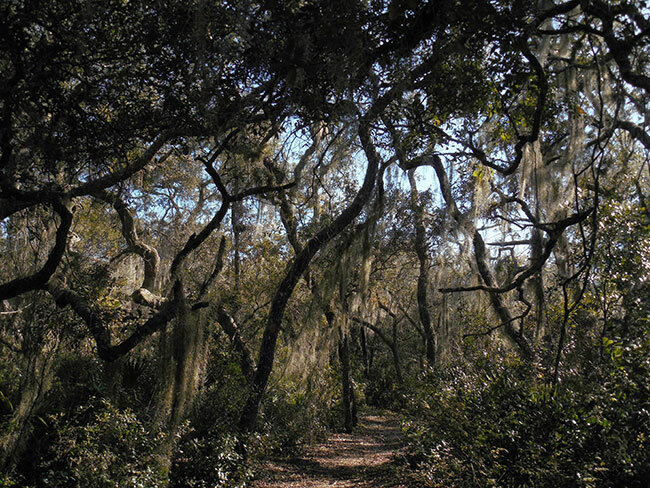 I made my way out of the maze of forest trails through the thick brush and palmettos that opened up onto the edge of a big sand berm. This was probably not the exit, and I was probably no longer on the “real” trail, rather this was likely an offshoot trail that had connected back to an older trail that was now closed. Taking it down a notch, I decided to spend part of the day just working on learning to read terrain better. I needed to slow down and focus on “seeing” the cues. Setting off on foot for a wilderness hike I was determined to learn to look at the forest and see more than just a pretty landscape. The “trail” I had chosen, called “Jody’s Trace” started off as a well-defined narrow path but seemed to disappear as it passed into the thicker brush. Unlike the carefully manicured trails I am used to, this one was neither clear nor well-marked. Trail maintenance in the “wilderness area” is purposely kept to a minimum, and I needed to look carefully to find traces of the path. An occasional blaze was the only confirmation that I was still “on” the trail. Coming out of the woods into a clearing the “trail” seemed to disappear completely. Scraggly bushes and tall grass looked the same on all sides. There were no trees and no blazes. Somehow I found “the” path or “a” path that brought me back into the woodline on the other side where I could see another distant blaze but a large fallen tree blocked the way. Climbing over part of it and squeezing through a tangle of branches, I found myself steps away from a huge drop. Carefully going around the edge of the sinkhole filled with lush tropical vegetation, I momentarily lost my “direction.” I knew I should be going east at this point, but was no longer sure which way east was. I looked to the sun to roughly determine my position and continued back on the trail as its outline became clearer again. It had been more difficult than I expected, but the exercise had forced me to pay attention to nuances in the landscape. The marsh was transformed to a glowing golden tone as the sun inched closer to the horizon. A pair of herons made a ruckus before flying off into the orange sky, their silhouettes shrinking until they disappeared in the distance. A heightened sense of situational awareness made everything seem like a new discovery. I was learning to confront the unknown. In contrast, here the only information I have is what is on the map. And while the topo maps give clues to big terrain features, the level of detail tis limited. 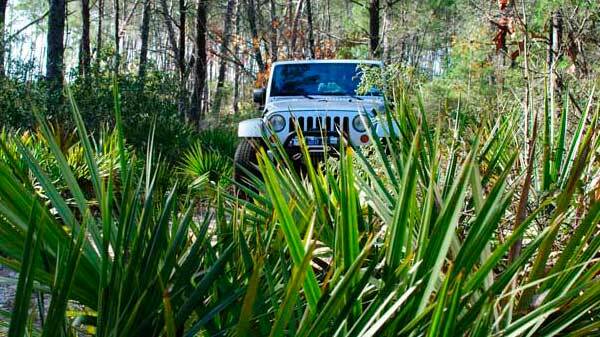 Terrain features smaller than the contour lines of the map can still be very big obstacles — even for a Jeep. And trail conditions vary widely. In this sub-tropical forest, nature reclaims the land at a rapid pace, and trails that see only light usage can be quite overgrown. I found myself “trimming” the tangled brush that impeded my passage by hand, wishing i had brought a machete. Driving north-west into the heart of an OHV-usage area l was enjoying the playful ups and downs of a series of small sandy hills. I had marked off a route with a vague “destination,” but my goal was really just to explore a bit further in this direction. As I turned deeper into the bush, the trail began to become very narrow, and I soon found myself driving in a “trench” of sorts that seemed to be cut into the base of the jungle. It was barely the width of the Jeep. There would be no way of turning around in here if I came across trouble, I could only keep moving forward. It became a question of terrain assessment and judgement, as I walked ahead for a while, checking to see if anything looked impassable. Walking the trench, I wondered to myself how far I should scout forward. Would I end up walking the entire length of an unknown trail or should I just drive ahead and take my chances. It had rained recently and there was a bit of mud here and there, but from what I could see there was nothing the Jeep couldn’t easily handle. I decided to drive on forward. 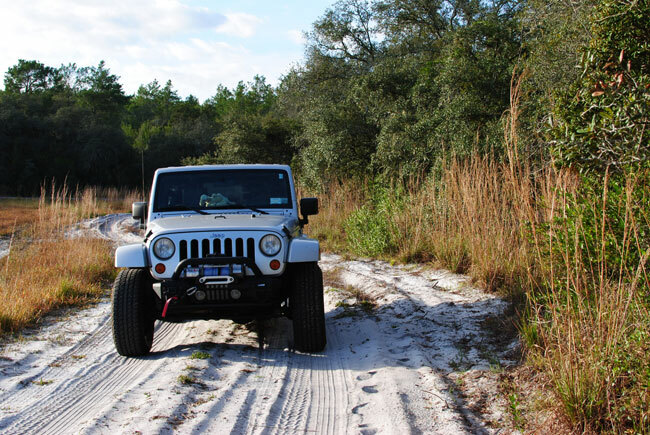 It was visually “interesting,” but comfortable driving until it started becoming very uneven with deep ruts forcing me into an off-camber tilt that made the narrow passage seem even tighter as the top of the Jeep leaned uncomfortably close to the roots sticking out the side. I had to keep going, hoping there was not some “bad” surprise up ahead. The forest seemed to be closing in on me, ready to swallow up the Jeep. I thought about how much more difficult it would be if it was muddy. Glad for the solid ground below, I continued, marveling at the deep green of the moss on the earth wall just inches from my face. Finally, a feeling of relief as the trench began to open up and flatten out where the trail approached an intersection with a bigger trail. The flat sandy forest trail was nice and easy. 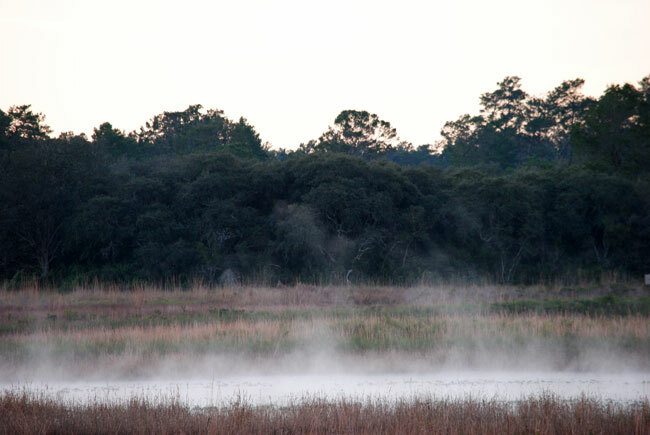 There was “smoke on the water” as I passed a small marshy spot hidden behind thick foliage. I was enjoying the drive when I came upon a fallen tree across the trail. 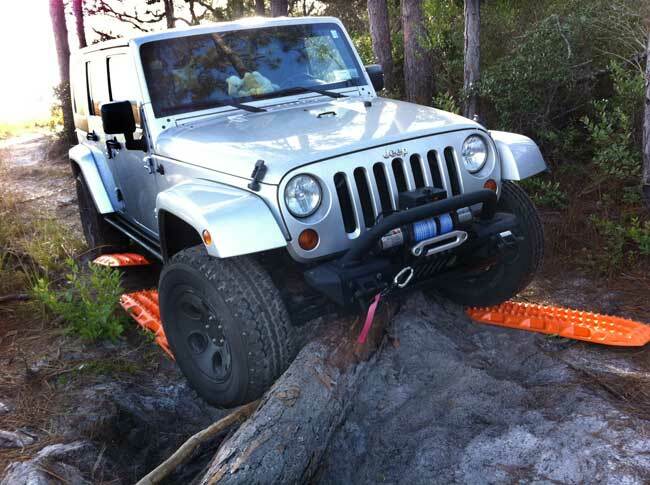 A tall spindly pine trunk with no messy branches in the way, It was the simplest of obstacles for a Jeep. I stepped up onto it at a slight angle with my driver’s side tire then as my passenger side tire went up, the whole jeep slid more than a foot to the right, and the pax tire slipped back off the log. Now it was just spinning. The tire had stripped the bark off about two feet of the tree trunk, and the tree itself had slid forward in the sand. That front pax tire was in a sandy hole. A second attempt to get over the log just started “digging” the tire down into the softer sand below. The tree trunk was straddled between the front two tires, and neither one had good traction. With the front diff practically snagged on the tree, I couldn’t go forward and couldn’t go back. My first truly “stuck alone” scenario. As I considered my options, I recalled all those conversations about “minimum of two vehicles.” Luckily I had brought a full range of recovery gear. Looking over the situation, I decided to try to use the Maxtrax for an initial attempt at “unstuck-ing” myself before getting involved with the more mechanical solutions. First I wedged some big branches between the front passenger tire and the tree trunk, then I jammed one of the Maxtrax as far under that tire as possible. The back tires had started digging down too, so I placed two Maxtrax under them as well. The final Maxtrax went under the front driver’s side tire, which was actually off the ground. I needed to wedge a branch under there to ensure traction. For good measure, I packed the moist sand against the front of the tree trunk, to prevent it from moving forward again. The Ocala National Forest, located three miles (5 km) east of Ocala and 16 miles (26 km) southeast of Gainesville, covers approximately 600 square miles (1,570 km2) of Central Florida. Established in 1908, it is the oldest national forest east of the Mississippi River and the southernmost national forest in the continental U.S. The word Ocala is thought to be a derivative of a Timucuan Indian term meaning 'fair land' or 'big hammock.' 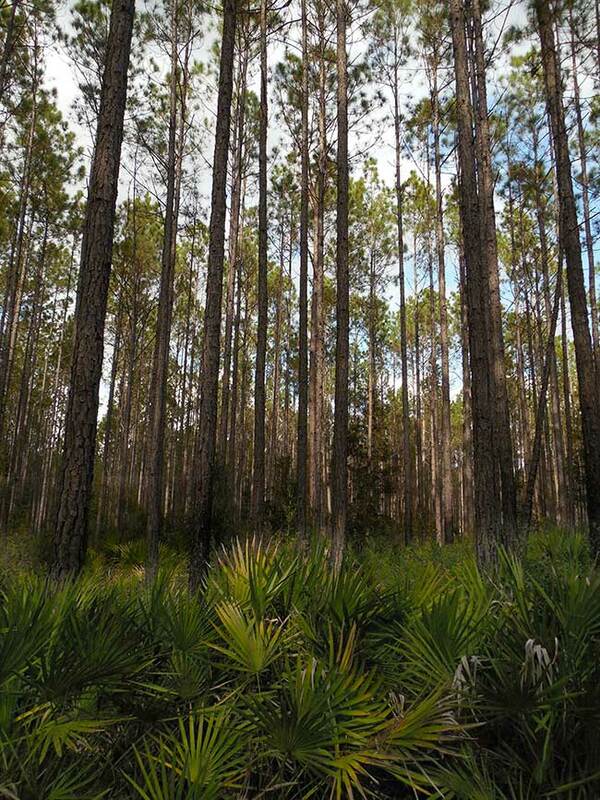 The forest contains the largest concentration of sand pine in the world as well as some of the best remaining stands of longleaf pine in central Florida. The Ocala National Forest is most easily accessed from the town of Ocala via FL-40 along the Black Bear Scenic Byway drive. It can also be reached from the north via FL-19.